The word 'Ikshwaku' in Sanskrit means 'sugar-cane'. There is a South-East Asian myth which describe the birth of humanity from 'sugar-cane'. Ikshwakus thus have a South East Asian connection. It is however not clear if this was due to the migration of Ikshwakus from India to South East Asia or vice versa. Sugarcane is a bamboo like perennial grass-plant which is native to India. Crystallized sugar was reported 5,000 years ago in the Sindhu-Saraswati Civilization. Indian traders brought sugar to the rest of the world. Sugarcane cultivation is dominant in Uttarpradesh and Maharashtra states of India. All these favors an Indian origin of Ikshwakus who probably originated in Sindhu-Saraswati valley and migrated to Ganga founding the city of Ayodhya. A second scenario is a South-East origin of Ikshwakus. This theory assumes that the Ikswakus or their ancestors lived in coastal Andhara region in the south-east coast of India. Underwater volcanic eruptions or earth-quacks caused Tsunamis in Bay of Bangal causing huge floods in coastal Andhra region, the memory of which is present in the Great-Flood history of Manu, the ancestor of the Ikshwakus. Due to floods, they migrated north-westward along the Godavari river. Passing through what is now northern Andhra Pradesh and Chathisgad which then was known as Dandakaranya (Dantewada) and Dakshina Kosala (Raigarh), they reached Ganga and founded Ayodhya. This was also the same southern-path traversed by Rama (in the opposite direction, starting from Ayodhya) during his fourteen year long forest life. He however took a diversion to the west after passing through Dandakaranya to reach Kishkindha (in [http://en.wikipedia.org/wiki/Hampi], Karnataka). Another branch of Ikshwakus migrated along the Godavari river and reached Narmada and Saraswati river valleys. This view of south-eastern origin of Ikshwakus is also supported by the fact that the patriarch Manu, the father of Ikshwaku is mentioned as a king of the Dravidas a territory that lied in coastal Andhra Pradesh. It is however not clear if this migration from the south east coast of India was part of a larger migration starting from the South East Asia itself. In recorded period of history of India, a dynasty of Ikshwaksus were attested as ruling in Andhra Pradesh. The presence of traders in South East Asia patronized by the Ikshwakus and other dynasties in South India is also well attested in recorded history of South India. This could be the reason why the Ikshwaku culture spread into the South East Asia. It is possible that the migration of Ikswakus from Saraswati to Ganga was subsequent to their migration from coastal Andhra to Godavari, Narmada and finally to Saraswati. At Mbh.2.14 Krishna tells to Yudhisthira during pereparation for the Rajasuya scrifice:- "The numerous royal lines and other ordinary Kshatriyas all represent themselves to be the descendants of Aila and Ikshwaku. The descendants of Aila, O king, as, indeed, the kings of Ikshwaku's race, are, know O bull of the Bharata race, each divided into a hundred separate dynasties. The descendants of Yayati and the Bhojas are great, both in extent number and accomplishments. O king, these last are to-day scattered all over the earth." From this narration it is clear that Ikshwakus and Ailas (Aila-Puru-Bharata-Kuru, Panchala) were the most prominent royal dynasties during the reign of the Pandavas. Next comes the dynasties of the Yadavas and the Bhojas. Each of these main dynasties were divided further to form close to a hundred separate dynasties. We know of the Purus, the Bharatas, the Kurus and the Panchalas to be separate dynasties that sprang from the Aila dynasty. Among the Yadus were the distinct dynasties like the Andhakas (same as the Andhrakas? ), the Vrishnis and the Bhojas (The Bhojas are sometimes described as different from the Yadavas and sometimes as a branch of the Yadavas). The Madhavas too is considered as a branch of the Yadavas. Similarly we could consider the Raghavas as a distinct branch of the Ikswakus. Rama was born in this lineage. The lineage of Marutta, the lineage of Vena and Prithu, the lineage of Yuvanaswa and Kuvalaswa, the lineage of Mandhatri and Trasadasyu, the lineage of Kalmashapada, the lineage of Harishchandra, the lineage of Muchukunda - all of these seems to be different branches of the Ikshwaku lineage. The lineage of Nabhaga and Amvarisha is described in Mahabharatha as lineage parallel to Ikshwaku-lineage, not as its branch. Similarly the lineage of Vatsa, Haihaya and Vitahavya that sprang from Saryati is described as parallel lineage. Several women in the race of Ikshwaku were mentioned as wives of famous kings in the Aila-Puru-Bharata-Kuru lineage. Thus we have Suvarna as the wife of king Suhotra. The mother of Kuru the founder of the Kuru dynasty was Tapati. She was the wife of Samvarana who obtained her as wife from her father Surya with the help of Vasistha. The priests of Ikshwaku kings were from the lineage of Vasistha. Here Surya is described as sun-god, but actually he was an Ikshwaku king, since Ikshwaku dynasty was also known as the solar-dynasty or Surya Vamsa due to their patronage of the sun-god and due to their interest in the solar-astronomy and solar calender. After the analysis of the myths related to her is found to be an Ikshwaku princess. Kingdom of Kasi was often ruled by the Ikshwaku's from Ayodhya and often it was considered as part of the Kosala kingdom of the Ikshwakus. Thus it seems the mothers of Dhritarashtra and Pandu viz. Amvika and Amvalika who were princesses from Kashi were of Ikshwaku descend. They were often described as the Kausalyas or the princesses from Kosala. Mahabharata mentions the founder king Ikshwaku as a son of the great patriarch Manu. thus we have at Mbh.1.75:- Manu begat ten children named Vena, Dhrishnu, Narishyan, Nabhaga, Ikshvaku, Karusha, Saryati, the eighth, a daughter named Ila, Prishadhru the ninth, and Nabhagarishta, the tenth. Among this, princess Ila is the founder of Aila dynasty which later expanded into Puru, Bharata and Kuru linages in which the Kauravas and Pandavas are born. Thus Mahabharata consider Ikshwaku as an elder bother of Ila. It indirectly gives the impression that the Ikshwakus were older than the Ailas. Vena is mentioned as the son of Ikshwaku as described at (Mbh.1.75), However we have another history about him at Mbh.12.58:- Vishnu > Virajas > Krittimat > Kardama > Anaga > Ativala > Vena > Prithu. Vena was a bad king and thus slain by his people. His son Prithu was then installed at the throne. The Nishadas and Mlechchhas were attributed to be descendants of Vena. Nishadas were described as short-limbed, resembling a charred brand, with blood-red eyes and black hair and as tribes that have the hills and the forests for their abode. These were treated here like the lost tribes in Bible. Kardama's another son Adama is equated by some to the Adam of Bible. Prithu the son of Vena was also known as Vainya. He was revered by his people as god calling him the eighth from Vishnu. :- Sukra became his priest. The Valakhilyas became his counsellors, and the Saraswatas his companions. The great and illustrious Rishi Garga became his astrologer. This high declaration of the Srutis is current among men that Prithu is the eighth from Vishnu. This seems to be the seed of the myth regarding Krishna as the eight incarnation of Vishnu. The Sutas and Magadhas became his bards and panegyrists. Gratified, Prithu, gave unto Suta the land lying on the sea-coast (Anga and Vanga kingdoms), and unto Magadha the country since known as Magadha. It was Prithu who made the terrestrial surface level (probably by making roads for riding chariots?). Prithu is mentioned as the creator of the weapon bow. He is described as an Emperor. The history of Prithu is described at Mbh.12.58 and repeated at Mbh.7.65 and at 12.29. Among them are the claims like, when Prithu goes to sea the water gets solidified. At Mbh.14.4 we have a different version of the Ikswaku lineage:- Manu of Krita Age had a son named Prasandhi. His son was Kshupa. Kshupa's son was Ikshwaku. Ikshwaku's son was Vinsa whose son was Vivinsa. His son was Khaninetra. He was dethroned by people who installed his son Suvarcha in the throne. Suvarcha is also known as Karandhama. His son Avikshit was born at the beginning of Treta Yuga. Avikshit was also known as Parikshit as per the reference in (Mbh.13.137):- Marutta, the son of Parikshita and the grandson of Karandhama, gave his daughter in marriage to Angiras. Angiras was Avikshit's priest. Avikshit's son was Marutta. The subsequent chapters of Mahabharata describe the sacrifice of Marutta in the north of Himalayas which resulted in much gold and other treasures deposited underground. This treasure was later excavated by Yudhisthira. The central theme of the narration is Marutta's quarrel with Indra. who does not wanted to share his priest Vrihaspati with Marutta. Thus Marutta's territory lied adjacent to that of Indra extending to the north of the Himalays. 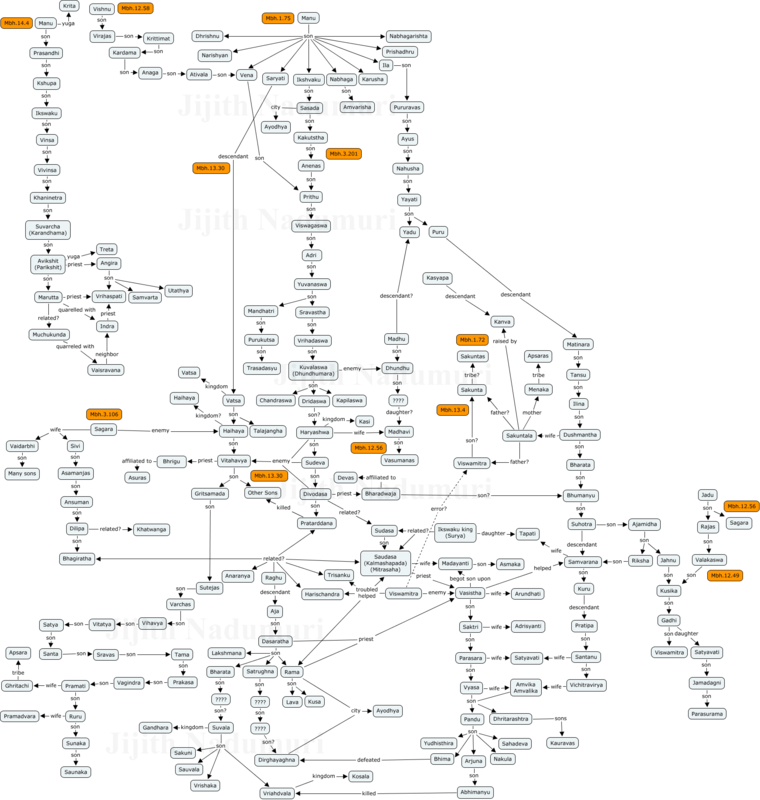 The connection of Muchukunda with Ikshwaku linege is not evident in Mahabharata. The only reference that indicate some connection is the mention of Vasistha as his priest. Muchukunda is mentioned as fighting a battle with Vaisravana the king of the Yakshas (who ruled territories to the north of the Himalayas, in southern Tibet). This could be an indication of the Ikswaku expansion to the north of the Himalayas. (Gautama Buddha's Sakya dynasty in Nepal claims themselves to be Ikswakus.) The battle of Muchukunda and Vaisravana is briefed at (Mbh.5.132) and detailed at ([Mbh.12.73). Muchukunda also appears in the famous History of the sword in Mahabharata. (Danavas > Rudra > Vishnu > Marichi > sages (Kasyapa) > Aditya > Manu > Kshupa > Ikswaku > Pururavas > Ayus > Nahusha > Yayati > Puru > Amurtarya > Bhumisaya > Bharata > Ailavila > Dhundhumara > Kamvoja > Muchukunda > Marutta > Raivata > Yuvanaswa > Raghu > Hiranaswa > Sunaka > Usinara > Bhojas & Yadavas > Sivi > Pradarddana > Ashtaka (Aztec?) > Prishadaswa > Bharadwaja > Drona > Pandavas. If this chain of men indicate any succession, then Muchukunda lived after Dhundhumara (Kuvalaswa) but before Yuvanaswa which is not consistent with the lineage described at Mbh.03.201. However Muchukunda's connection to Kamvoja's (if there is one) need some investigation. Mbh.03.201 describe the lineage from Ikshwaku to Vrihadaswa:- Markandeya said, O king (Yudhisthira), after the death of Ikshvaku, a highly virtuous king of the name of Sasada, ascending the throne of Ayodhya ruled this earth. And from Sasada was descended Kakutstha of great energy. And Kakutshta had a son of name Anenas. And Anenas had a son named Prithu and Prithu had a son named Viswagaswa and from Viswagaswa sprang Adri and from Adri sprang Yuvanaswa and from Yuvanaswa sprang Sravastha and it was by this Sravastha that the city called Sravasthi was built and from Sravastha was descended Vrihadaswa and from Vrihadaswa sprang Kuvalaswa and Kuvalaswa had twentyone thousand sons and all these sons were fierce and powerful and skilled in learning. And Kuvalaswa excelled his father in every quality. And when the time came, his father Vrihadaswa installed him, the brave and highly virtuous Kuvalaswa, on the throne. Some names like that of Prithu seems to be inserted into the Ikswaku lineage. Mandhatri is mentioned as a son of Yuvanaswa at Mbh.7.60 and repeated at Mbh.12.14. He is mentioned as born through a surgical operation. Mandhatri vanquished, by his bow Janamejaya and Sudhanwan and Jaya and Suna and Vrihadratha and Nriga. Thus he conquered vast land. At (Mbh.12.63) we have:- In days of old when the Danavas had multiplied and swept away all barriers and distinctions the powerful Mandhatri became king. At (Mbh.12.64) we get to know who were these Danavas:- Mandhatri said, What duties should be performed by the Yavanas, the Kiratas, the Gandharvas, the Chinas, the Savaras, the Barbaras, the Sakas, the Tusharas, the Kankas, the Pathavas, the Andhras, the Madrakas, the Paundras, the Pulindas, the Ramathas, the Kamvojas, the several castes that have sprung Lip from Brahmanas and Kshatriyas, the Vaisyas, and the Sudras, that reside in the dominions of Arya kings? At (Mbh.7.60) we have:- King Mandhatri, having bestowed the earth upon the Brahmanas, at last disappeared like the sun. All the narration above and the exceptional myth of him being revived by Indra after the Aswini gods surgically took him from the stomach of his father indicates that Mandhata was treated like a god. His profile resembles that of Kalki who fought against the invading tribes at the end of Kali Yuga (2000 BC?). At (Mbh.15.20) Purukutsa is mentioned as the son of Mandhatri. At (Mbh.3.98) Trasadasyu is mentioned as the son of Purukutsa. History of Kuvalaswa is detailed in three chapters from Mbh.03.201 to Mbh.03.203. He is mentioned as earning the title Dhundhumara by defeating Dhundhu, the son of Madhu. This feat was done in a sea of sands (desert) known by the name of Ujjalaka (Mbh.03.202). This seems to be the dried up Thar desert in Rajastan that resulted due to the disappearance of the Saraswati river. This area was dominated by the Yadavas and the Nishadas at some period of time. In this fight Kuvalaswa lost many of his sons. This Ikshwaku-Yadava rivalry, to dominate in the regions south of river Ganga is explicitly evident from a careful analysis of Mahabharata. The rivalry of Kuvalaswa and Dhundhu is one among them. Similarly we have Satrughna (the youngest brother of Dasarathi Rama) defeating Madhu (either the founder or a descendant of the Madhava race) whose territory lied in the south-western banks of Yamuna. This territory is identified to be the same as the Yadava kingdom named Surasena in which Krishna was born. At Mbh.03.203 we have:- After the slaughter of all his sons, king Kuvalaswa had still three sons left, they were called Dridaswa, Kapilaswa and Chandraswa. It is from them, that the illustrious line of kings belonging to Ikshvaku's race hath sprung. It was thus, that the great Daitya of the name Dhundhu, the son of Madhu and Kaitabha was slain by Kuvalaswa and it was for this also that king came to be called by the name of Dhundhumara. Vishnu Purana describes Haryyaswa as the son of Chandraswa and Bhagavata as the son of Dritaswa. Mahabharata has no references that indicates that Haryaswa was the son of any one of them, but describe him as an Ikswaku king of Ayodhya at Mbh.5.115. Here Vasumanas is mentioned as the son of Haryyaswa begotten upon Madhavi brought by a certain Brahmana by the name Galava. Brahmana Galava was the disciple of Viswamitra. The name Madhavi indicates that she belongs to the Madhu's race. But here she is described as the daughter of Yayati of Aila lineage. Probably she was a descendant and not the daughter of Yayati. The following is a probable sequence:- Yayati > Yadu > Madhu > Dhundhu > ? > Madhavi. The History of Madhavi is a topic requiring separate analysis. Focusing on the points relevant here, we can note that, Madhavi was a woman belonging to the Madhu's race, thus a woman belonging to the enemy-tribe of the Ikshwaku kings. Haryyaswa probably treated her as such (Mbh.5.116). He gave the Brahmana a dower of two hundred steeds in exchange of the woman. After begetting Vasumanas, he gave Madhavi back to Galava! From the subsequent chapters we get two of the probable contemporaries of Haryaswa. One among them is Divodasa, the son of Bhimasena and the king of Kasi. The narration describes that Divodasa begot Pratardana (Mbh.5.117) and Bhoja king Usinara begot Sivi (Mbh.5.118) upon Madhavi in the same manner as Haryyaswa begot Vasumanas. In exchange of Madhavi Galava got 200 horses each. Thus Gavala got 600 steeds in total. Galava gave the 600 steeds and also Madhavi to his preceptor Viswamitra who begat upon Madhavi another son named Ashtaka. Viswamitra gave the steeds to Madhavi's son. He gave Madhavi back to Galava who returned her back to her own father. It is also to be noted that the story of Madhavi giving birth to Pratardana or Sivi as sons of Divodasa or Usinara respectively is not supported by other passage in Mahabharata. Sivi is often mentioned as the son of Usinara, but has an alternate history too (Daksha > Diti > Hiranyakasipu > Sivi (brother to Prahlada) as per Mbh.1.65. It is also interesting to know why all these kings had the name Ashwa (horse) postfixed to their name. At Mbh.5.119 we have that the source of the horses were Richika who got it from the great mart of steeds at Aswatirtha in Varuna's territory. Varuna's territory is usually assumed to be in the west. Richika brought 1000 steeds of which 400 drowned in Vitastha river during transportation. Thus Varuna's territory which is home to excellent white steeds lied at least beyond the far west of Vitastha (Jhelum river, probably Afghanistan which is derived from the Sanskrit name Aswa-gana-sthana, the territory of the horse breeders). Varuna is mentioned as the source of the excellent chariot of Arjuna which helped him to win the Kurukshetra war. Arjuna's bow Gandiva and Krishna's discuss too came from Varuna. Thus excellent chariots and weapons too seems to had come from the same western region where good steeds were found. Richika gave the steed he got from Varuna's territories to Gadhi (Aila-Puru-Bharata » Ajamidha > Jahnu > Kushika > Gadhi > Viswamitra) who ruled at Kanyakuvja (Kanauj). Gadhi gave her daughter Satyavati to Richika in exchange of the horses. Gadhi gave the horses to some Brahmanas and the three kings viz. Haryaswa, Divodasa and Usinara got these from those Brahmanas. Galava got these horses from these kings and gave it to his preceptor Viswamitra. Thus Gadhi's horses returned to Gadhi's son Viswamitra! Viswamitra gave it to his son begotten upon Madhavi.